GLOBAL POLITICAL AWAKENING: 17 Fake Cell Phone Towers Discovered Across U.S.
17 Fake Cell Phone Towers Discovered Across U.S.
Now why would someone want to erect fake cell phone towers across the United States? Who would have the money and the manpower to do so? Who owns them? Who is using them to track your calls? These are just a few of the questions Les Goldsmith, Chief Executive of the security company ESD America, wants answered. One of our customers took a road trip from Florida to North Carolina and he found eight different interceptors on that trip. We even found one at a casino in Las Vegas. So we begin to wonder – are some of them US government interceptors? Or are some of them Chinese interceptors? Whose interceptor is it? Who are they, that’s listening to calls around military bases? Is it just the US military, or are they foreign governments doing it? The point is: we don’t really know whose they are. They were discovered by people using a heavily customised Android device called the CryptoPhone 500. It uses a secure version of the software which can tell if the phone is being subjected to what is known as a baseband attack. It is then possible to trace the location of the offending tower. 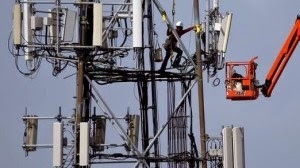 The fake cell towers were detected in July, but the report states there could be more. The map above shows 17 interceptor towers that have been found so far. Goldsmith is sure there are more…many more. You can read the whole article in Popular Science here.